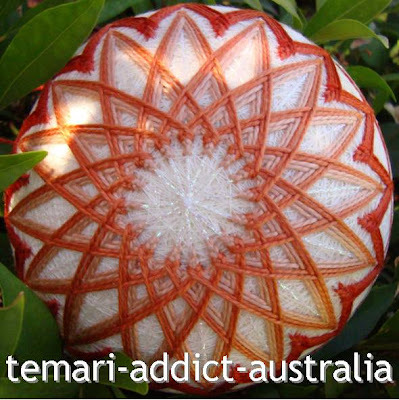 Here is a picture of the temari I am sending to Japan as part of the Talk Temari Kiku for Japan project. I have the other pole to complete, so I hope to post it in the morning. I think that this style of Kiku is my favourite, I have trouble adding many rows near the top of the stitch... I always forget to lay the first row down a little loosely so I could only manage four rows on this occasion. I wanted more petals so I added another section of Kiku petals underneath the main design using the same Chidori kagari stitching. I was thinking of the type of flower with a tight center and additional rows of petals surrounding it - see the image below. The Obi design is very simple on this one, I feel like this is a time to quietly honour tradition instead of show something flashy to take away from the design at the poles. I used 4 shades of Cosmo thread (185, 186, 187 and 188) and Rainbow Gallery ND4 for the markings on a pale cream ball. As I have been stitching I've meditated on my desire for a prompt recovery for all the damaged cities and towns, I stitched my strength into this temari. I've prayed for everyone who have lost their family or friends, I stitched my love and compassion into this temari. 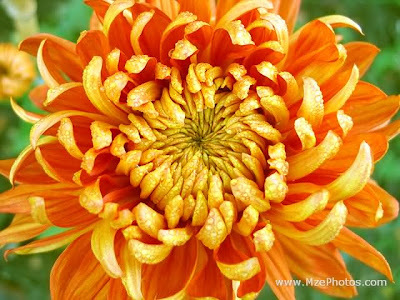 I focused on the symbol of the rising sun, which is featured on the Japanese Flag, and stitched my belief and optimism that the sun will rise again for the nation of Japan.